Remnants of Combo, an animation by David Ellis and Blu. Photo by RJ Rushmore. Although credit must be given to David Ellis (with whom Blu eventually collaborated) for the motion paintings like this one that Ellis was creating long before Blu’s animations, they are not as well known among average street art fans, are not usually made on the street and are not always easy to find online. Really, Blu popularized street animations. 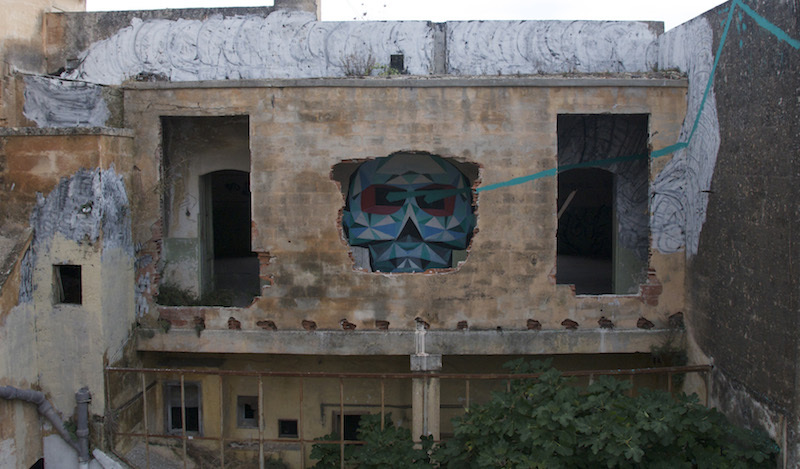 With his film Muto, Blu astounded the world by combining murals and animation, with each frame of the film being a still photograph which combined to animate a series of murals on the streets of Buenos Aires. Except that with each frame, the previous frame was at least partially destroyed, so rather than leaving hundreds of murals around the city, what remained was mostly just patches of white paint. While Blu was working on Muto, it was probably very interesting to watch and a person walking by him a few times a day could see something different each time, but once Blu left, the work was essentially gone as well. It seems odd to even call Muto and other street animations street art, since the more complex animations do not give much to the people who see individual frames on the street. The work isn’t meant to be seen that way. It’s clearly meant to be seen as a finished video. Even if the individual frames were interesting, Muto is a story, and no single frame of Muto tells the entire story. Without a doubt, Muto is a masterpiece, and I do not mean to belittle its importance just because it is not street art in the same way that Blu’s murals are. Rather, I would like to acknowledge that difference and applaud Blu for using both the street and the internet in a great way in order to get his ideas out. The individual frames of Muto hardly matter except that they make up the finished product, the film, which Blu posted online. It has since been seen by millions of people.